Voice For The Voiceless: So We are back to this again? So We are back to this again? 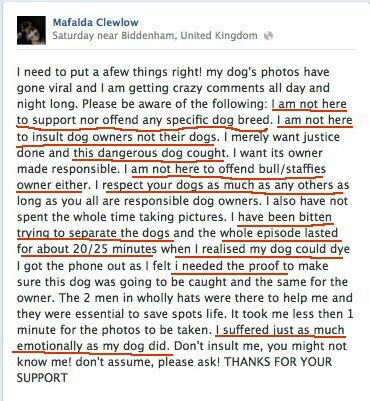 I swore, I wasn't going to do this, however, since a majority of people are falling for Mafalda's BS of not being a Hater toward the Pit Bull Type Breed, Let's just take a Look at what she said, Shall we? And clearly you have no idea what a Dog fighting dog is. This dog was not set up for a Dog fight, he was merely not socialized correctly or dog friendly. 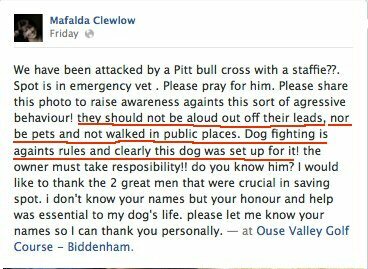 Which is the OWNERS FAULT not the dogs. Those great men you are congratulating, one is the owner the others are his friends... Might I add, they were PULLING the dog off of yours When you clearly did nothing but take Pictures. Again Who is setting up who? Dog fighters leave their dogs on the leash when they street fight, Dog Fighters carry BREAK STICKS and so there goes your theory of them being a DOG FIGHTER. They are nothing more then Uneducated Irresponsible Owners. Like yourself who also had YOUR DOG off the leash, Who's to say that YOUR DOG didn't start this fight, since you only took pictures midway through the scuffle. Just Saying, I don't know why other people haven't come to this conclusion either. Mafalda, Which is it 20 or 25? You're not here to insult? You did insult and you blamed the dog. You did not suffer as much as your dog did, How did you get bitten? No Seriously HOW!? You didn't do anything but STAND THERE AND TAKE PHOTO'S!!! Afterward you REPORTED IT TO THE PRESS and then the POLICE. What the hell kind of person reports it to the PRESS FIRST? No please tell me, I would love to know. Crime Reference Number: JH/9478/2013 yes I did call them, and they told me that you didn't report it right away, that they found out everything on Saturday, And on Sunday this was in the DAILYMAIL news site. Monday Morning My time which was 3 am, the Police had his picture on their facebook page. So please tell me how she went DIRECTLY to the POLICE with this Incident? She didn't, and for those who are confronting Mafalda', Don't bother, she is deleting and blocking people. You will get nothing from her. Truthfully Mafalda I don't have to know you to insult you.Because of your actions and what you have done, That's plenty for me to INSULT you, since you INSULTED my BREED. Your dogs wounds would have been proof enough of the attack, You could have waited until both dogs were pulled from each other to take a picture of the Man who, might I add PULLED his dog off of yours. All of you involved MC and the 4 other people, You are all IRRESPONSIBLE, and because of this, BOTH dogs were injured.